The growing statistics of people affected with diabetes is quite alarming these days. About one in every 5 of our elder population is has diabetes in some degree of intensity. The fact that diabetes has an increasing influence of eyesight and other eye related issues increases the gravity of the situation. Studies show that people with diabetes are at a higher risk of contracting eye and vision problems that could eventually lead to blindness. 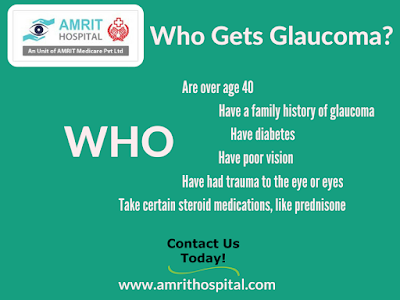 With world class treatment and facilities, when it comes to the realms of eye care, Amrit Hospital offers one of the best diabetes and retina services in the world. Now, let us have a look into the various effects of diabetes on our retina and the conditions caused thereof. Retina is the innermost layer in our eye that is responsible for receiving the light signals and transmitting it to the brain through optic nerves. 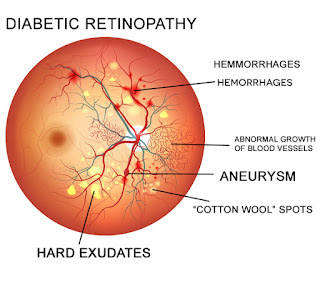 Patients with diabetes are at an increased risk of the condition called diabetic retinopathy. They occur in two stages namely proliferative and non proliferative. Diabetic retinopathy can be managed with the help of lasers as in photocoagulation and Anti-VEGF injection in some rare cases. Photocoagulation aims at protecting the central vision by direction laser beams to seal the leaking blood vessels in the retina. This laser treatment can be completed in about 3 sittings and helps in preventing further deterioration of vision. It does not help in restoring the lost vision, hence increasing the importance of an early detection of diabetic retinopathy. Anti-VEGF agents are an evolving treatment methodology and involve intravitreal injection. They are mainly used in treatment of proliferative diabetic retinopathy. The earlier the diagnosis and initiation of treatment, better is the result. Hence it is advisable to get your eyes checked up in every 6 months, once diagnosed with diabetes. Amrit Hospital is one of the best eye care centres in Chennai, offering the latest technologies in the field. Cataract is the clouding of ones eye's natural lens, which lies behind the iris and the pupil. Cataracts are the most common cause of vision loss in people over the age of 40 and are the most common cause of blindness in the world. In the beginning cataract has little effect on the vision. Later on the vision is blurred, similar to looking through a cloudy piece of glass. A cataract may make light from the sun or a lamp too bright or glaring. It may also come to notice that the oncoming headlights during the night causes more glare than before. Colors may not appear as bright as they once did. The lens inside the eye works much like a camera lens, focusing light onto the retina for clear vision. These lens help us to see things clearly and also adjust the eye's focus. The lens is mainly made of protein and water . The protein is arranged in a precise way that keeps the lens clear and let’s light passes through it. But as we age, some of the protein may combine together and start to cloud a small area of the lens. A cataract may grow larger and cloud more on the lens over time, making it harder to see. Cataract surgery is very successful in restoring vision. During surgery, the surgeon will remove the clouded lens and in most cases replace it with a clear, plastic IOL (Intraocular lenses). In addition to this, Bladeless cataract surgery is also used to treat cataract. It is a Laser assisted cataract surgery, which is based on computer guided technology that delivers a higher level of accuracy to the cataract surgery. Amrit Hospital, Chennai, been established with the intention to provide quality eye care at an affordable price. Their main focus is the treatment and care of patients from all levels. Squint eye is a condition in wherein there is a misalign­ment of the eyes. In other words, the two eyes are pointed in different directions. One eye may be looking straight ahead while the other is turned inward, outward etc. Muscles of the eyes control the movements of the eyes. If one muscle is tougher than the other, the eye will be turned in that direction. This is how a squint eye condition is formed. One has to weaken the stronger muscle and strengthen the weaker muscle to treat this. There are different reasons for squint eyes and it does to run in families. It may be caused by severe farsightedness that has been untreated in some cases. Substantial head trauma may also be the reason for squint eyes, as it can affect that portion of the brain which controls the muscles of the eye. Amrit Hospital has an expert team doctors that are specialized to handle such conditions. While they start by a prescription of eye injectables, external medications, eye yoga exercises and spectacles, extreme cases with severe squint need immediate surgery and the alignment issues are corrected to look normal. Crossed-eye surgeries are very common and we can see best results when we treat such conditions at a tender age. 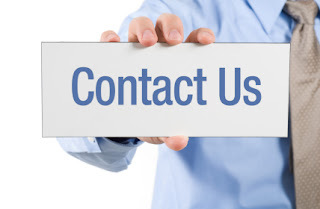 Bladeless cataract surgery is a revolution invention in the field of cataract surgery. 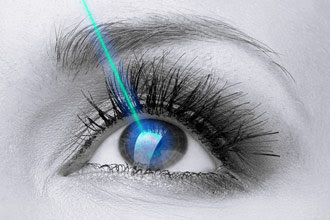 It is a Laser assisted cataract surgery, which is based on computer guided technology that delivers a higher level of accuracy to the cataract surgery. 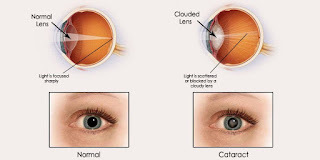 Basically, a cataract is a clouding of natural lens. The protein accumulation in the lens makes this cloudy condition and avoids passing of light clearly which results into vision loss. Humans have a natural clean and clear lens from their birth to see the world but with the age and other factors such as injury or long working pressure on eyes gradually these lens becomes cloudy. To make the vision clear and better it is recommended to remove cataract and replaced with an artificial lens through surgery. Genetic disorders such as myotonic dystrophy, down syndrome etc. LenSx® laser is the most advances life changing process that provides a customized cataract surgery experience and gives most safest and effective results. 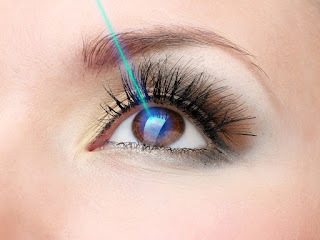 Laser technology permits doctors to regulate the exact length and depth of the incision which reduces the risk of certain problems, infections, and also reducing the recovering time. Amrit Hospital, Chennai has a good hold on bladeless cataract surgery and has a high rate of successful surgeries. The doctors of Amrit Hospital will work with the patients to understand their needs and accordingly determine best suitable technique. The surgical success depends on the careful evaluation of eyes before the surgery and LASIK gives freedom from glasses and lenses. 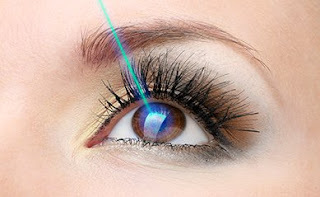 LASIK is Laser Assisted Insitu Keratomileusis which is a Painless Treatment with faster recovery. The usage of EX500 Excimer laser gives the best results. Anybody who is above 18 years with healthy eyes and stable vision at least for one year is eligible to get performed with LASIK treatment. High powers such as -15, autoimmune disease and pregnancy patients are not fit for LASIK. It is a day care treatment performed under local anesthesia. The patients will be advised to undergo a preliminary eye examination and measurements are taken to create a unique treatment profile for each individual. Anesthetist numbs the eyes by drops and a flap is created on the cornea which gently lifted back to expose the treatment area. Using the light energy the cornea is reshaped precisely. Soon after the surgery, the flap is repositioned to form a natural bandage and the healing begins. This procedure does not involve any pain, sutures or bandages and the following day the patient can resume normal activities. Amrit hospital was incepted on 1994 by Dr. Sohanraj, a popular ophthalmologist with a crew of medicos offers Lasik surgery in Chennai at an affordable cost.